So what with one thing and another, my hopes of getting to the auction or of taking home anything from it were not to be. Debbie says she paid $200 for this dress when she bought it from 20th Century Fox in 1971 — along with the rest of Marilyn’s extant wardrobe — at the pre-sale before the studio put what was left on the block. Profiles in History figured it would go for between one and two million dollars. They were too timid. By the time the gavel banged shut on it, the bidding had climbed to $4.6 million. When you figure in the auction house’s 20 percent cut, which is added to (not taken from) the sale price, that means somebody shelled out something like $5.52 million for this stylish summer frock. 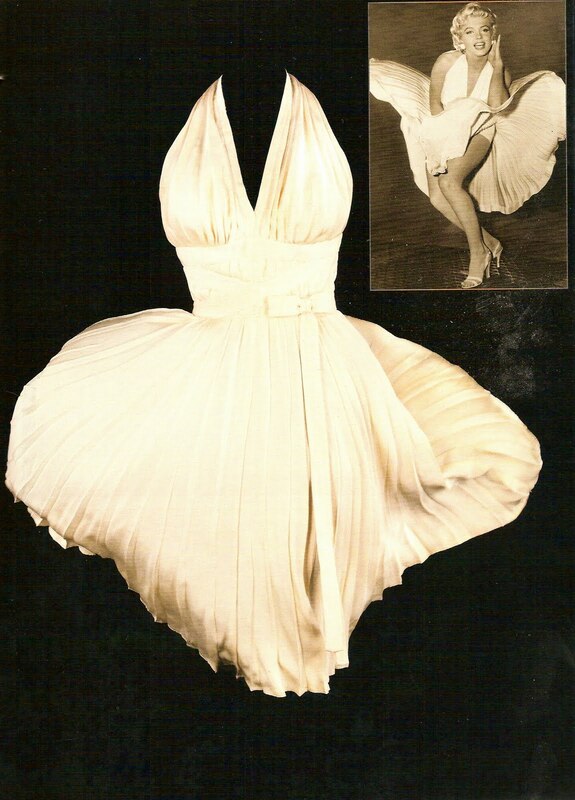 Marilyn’s “subway” dress was the top money-maker at the auction — in fact, it shattered the previous record for a single dress ($1.4 million in 1999, for another one of hers). 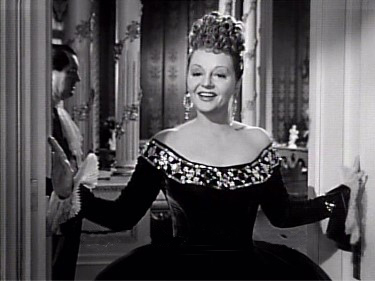 And her red sequined gown from Gentlemen Prefer Blondes came close to that ’99 record, going for $1.2 million. 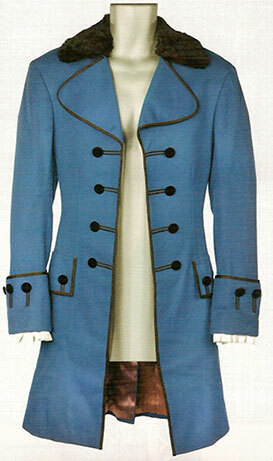 …and neither is this outfit. 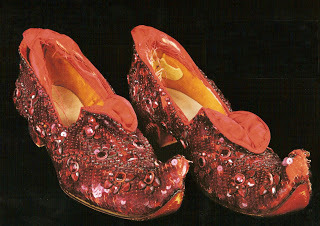 Both were worn by Judy Garland (with duplicates for her stand-in/double Bobbie Koshay) during the first two weeks of shooting. But when director Richard Thorpe was taken off the project, Dorothy Gale underwent a complete makeover from head (Garland’s blonde wig was out) to toes (which didn’t turn up on the slippers she eventually wore). The catalogue describes these two lots as “test” items; “rejects” would be closer to the truth. Nevertheless, the slippers went for $910,000, the dress and blouse for $510,00 to the same buyer (rumored to be representing Saudi oil money). That adds up to $1.42 million — and let’s not forget the 20 percent bump (another $284,000) for the house. Not bad for a cast-off ensemble that wound up never appearing on screen. That’s a pretty penny to shell out for a set of Judy Garland’s sweat stains, even at the rate two weeks of Technicolor lighting would have been bringing them on. If you were in the mood to dress up as Cleopatra next Halloween, you might have mix-and-matched your costume from the auction, beginning with this gold lame boudoir gown from Cecil B. DeMille’s 1934 take on the doomed Egyptian siren. Of course, you would have had to be ready to start the bidding at 20 grand, not to mention fitting into a garment cut to Claudette Colbert’s 18-inch waist. 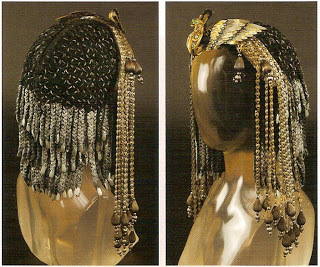 …there was this three-piece wig and silver-beaded headband worn by Vivien Leigh in Caesar and Cleopatra, starting at a more modest $800 to $1,200. If you still wanted to shop around, there were clothes and accessories from a number of other pictures that might have suited you: The Egyptian, The Ten Commandments, even Quo Vadis, Ben-Hur or Julius Caesar might have done in a pinch. Bear in mind that all the prices I’m quoting on this hypothetical Cleopatra ensemble are just the opening bids as they appear in the catalogue. I have no idea what the articles eventually sold for. It would take only two duelling Cleopatras with deep pockets and indomitable wills to send the bidding sky-high. Not everything at the auction required the resources of an Arab oil sheik or a Japanese electronics magnate. There were props, furniture, lobby cards, posters, letters, and other items — all a tad high-end, price-wise, for most collectors but not entirely out of the question. I cast a covetous eye on a six-sheet poster for How the West Was Won (my all-time favorite movie, and the one in which Debbie Reynolds herself gave the performance of her career), but at eight feet square, where would I keep it? 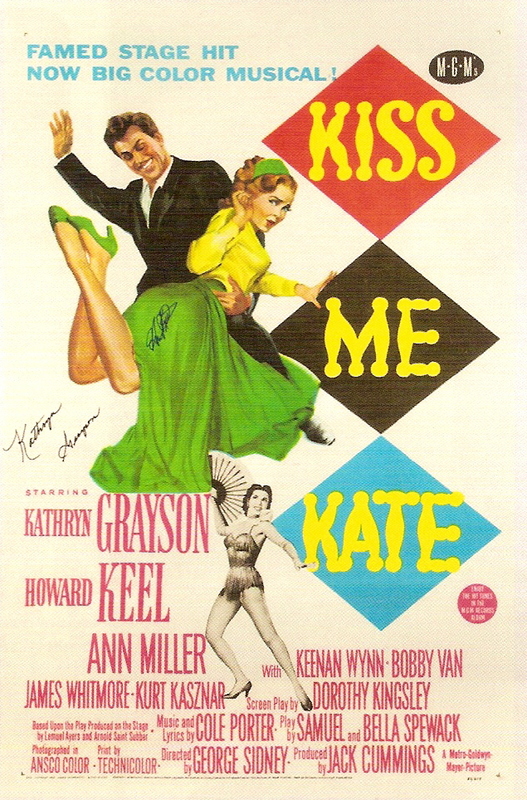 More reasonable, and in the same price range ($300 – $500), was this one-sheet from Kiss Me, Kate autographed by Kathryn Grayson and Howard Keel (notice that Keel, perfectly in character for his Petruchio/Fred Graham role, placed his signature right in the middle of Grayson’s pert little behind). Before The Day Lincoln Was Shot diverted my attention and resources, I was thinking I just might be able to follow this item for a bid or two — maybe more, if the competition wasn’t too stiff. While I sent for the catalogue in good faith (from the auction house’s point of view) and with nebulous dreams of getting some piece of the collection for my own, perusing the book once it arrived sent me off on a whole other train of thought. Like most movie buffs, I’ve known for decades that Debbie Reynolds was amassing this collection (she began in earnest in 1970, when MGM auctioned off everything but the studio’s real estate) with the idea of establishing a Hollywood museum. But until I actually started thumbing through the catalogue, I never quite grasped what a monumental collection she had managed to put together. And this seems to be only the tip of the iceberg — some 587 items, with Part 2 of the auction scheduled for next December. I read somewhere (and I can’t remember where now, so I can’t confirm it) that her full collection extends to over 5,000 pieces — meaning that this hefty two-pound catalogue represents barely the tenth part of the museum she hoped to set up. Truly, Debbie Reynolds is (or, alas, was) the Smithsonian Institution of historical Hollywood. Evidently, James Smithson had less trouble persuading the United States to accept his endowment than Debbie has had with Hollywood. According to Virginia Postrel, writing on Bloomberg.com, the auction became necessary when Debbie’s most recent attempt to establish her museum collapsed in 2009. The museum was going to be part of a tourist attraction called Belle Island in Pigeon Forge, Tennessee; apparently, when the Belle Island project went bankrupt it took Debbie’s museum down with it, leaving her with a lot of bills to pay. I’m not sure what Debbie’s vision for her museum was; myself, I’d have loved to see something like the Gene Autry Western Heritage Museum — now known as the Autry National Center — in Griffith Park. (And by the way, if you thought a “Gene Autry Museum” would amount to little more than a collection of Gene’s old guitars and posters from his movies, think again. It’s a world-class facility honoring every facet of America’s western heritage, and belongs at the top of your must-see list if you’re ever in Los Angeles.) Whatever Debbie’s ideas were, they’ve come to naught, while she’s spent half her life (and apparently all her money) acquiring and properly storing and maintaining umpteen thousand pieces of Hollywood history — and trying to find a home for them. All those years haven’t completely gone to waste. The day-to-day operations of Golden Age Hollywood are as over and done as the haggling in an Etruscan marketplace. We may still have the movies — and that ain’t exactly nothin’ — but it won’t do to lose sight of the nuts and bolts that went into building them. 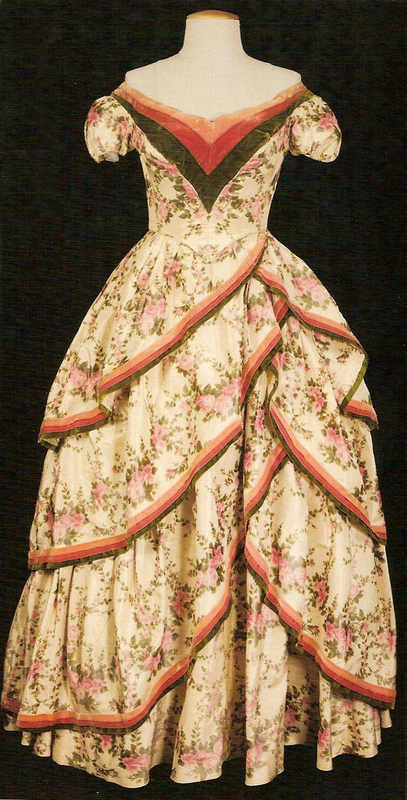 Being able to see and study these artifacts (like this gown Debbie wore as she crooned “A Home in the Meadow” in How the West Was Won) gives them a real-world texture and solidity that the movies alone, even HTWWW in all its 7-channel Cinerama glory, could never do. Without Debbie Reynolds, the items in her collection — Charlie Chaplin’s derby, Basil Rathbone’s Sherlock Holmes Inverness cape, Audrey Hepburn’s black-and-white Ascot dress (and Rex Harrison’s clash-matching brown suit), Barbra Streisand’s entire Funny Girl wardrobe, the kids’ drapery outfits and Julie Andrews’s guitar from The Sound of Music, Elizabeth Taylor’s Cleopatra sedan chair, palace decorations and Yul Brynner’s whip from The King and I, Bette Davis’s throne from The Virgin Queen, Empress Josephine’s royal bed from Desiree, Clifton Webb’s Boy Scout uniform from Mr. Scoutmaster, Howard Keel’s rifle from Annie Get Your Gun (or Clark Gable’s from Mogambo), the 20-foot miniature warships from The Winds of War, the Ark of the Covenant from David and Bathsheba — all might well be long-moldering somewhere in Los Angeles County’s bulging landfills. As frustrated and disappointed as Debbie might be, she can claim victory in (and we can thank her for) having shepherded all these things past the point where they were simply junk. …here’s how the battle of Actium looked on screen. The painting has a dramatic grandeur that contrasts sharply with the frame from the movie, which looks rather stodgy and pedestrian — and which, as it happens, is pretty much how the battle scene plays out in the movie itself. The same is true of other Cleopatra paintings on display in the catalogue; they show an energy and drive that survives only sporadically (and sometimes not at all) in the picture as it finally played in theaters. My point is: It’s thanks to Debbie Reynolds that I’m even able to make this comparison. Maybe 20th Century Fox would have preserved these paintings and sketches. Maybe. But they didn’t. In 1971, reeling from the financial debacles of white elephants like Dr. Dolittle, Star! and Hello, Dolly! (and for that matter, Cleopatra, which eventually turned a decent profit, but too late to do any good), and with Star Wars still six years in the unseeable future, I’m sure Fox was only too happy to pick up a little spare change by getting rid of things like this. And Debbie Reynolds was there to take them for safe-keeping. Now that Debbie is relinquishing her stewardship, we can reasonably assume that, whoever may wind up with this or that individual piece, the collection as a whole is safe for the forseeable future; nobody pays $5 million for a dress if they’re planning to leave it wadded up on the bottom shelf of the linen closet, or set it out on the curb next time the Salvation Army truck comes around. But where are the pieces going, and what precisely is going to become of them? Collectors can be a secretive and territorial bunch, not always quick to share. (And who can blame them? There are a lot of unscrupulous people out there; see here for a mention of the mysterious fate of Marcel Delgado’s production photos from The Lost World [’25] and King Kong [’33].) In the auction catalogue from Profiles in History, there’s a special plea from London’s Victoria and Albert Museum, asking for the loan of certain items in the collection for an exhibit on Hollywood costumes planned for October 2012 through January 2013. Debbie had promised curator Deborah Nadoolman Landis the use of any costumes she wanted — until the need to sell torpedoed the arrangement; it’ll be interesting to see if any of the new owners come through for the V&A. So the Debbie Reynolds Collection existed in the first place, and it’s (most likely) safe now; that’s the good news. The bad news is that it won’t be a collection anymore. True, last month’s auction was only 587 lots out of whatever (5,000? 10,000?) is the total. Does Debbie intend to sell only enough to pay her outstanding debts, then start again at Square One with what’s left? Perhaps, but she certainly sounds as if she’s in the process of washing her hands of the whole kit and kaboodle. That’s perfectly understandable, but it’s still a shame. 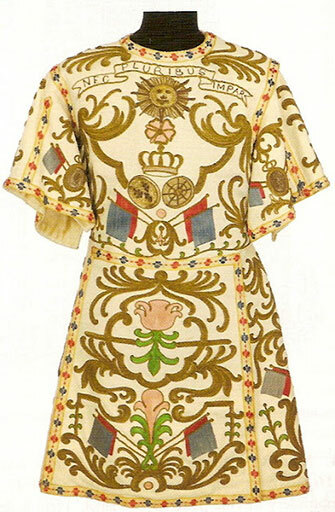 I hinted at this idea in Part 1, when I suggested mix-and-matching a Cleopatra costume from the 1930s, ’40s and ’60s. How instructive it would have been to compare costumes from the 1925 and ’59 versions of Ben-Hur; or Mutiny on the Bounty ’35 and ’62; or how Adrian dressed Charles Boyer as Napoleon in Conquest (’37) vs. how Rene Hubert and Charles LeMaire dressed Marlon Brando in Desiree. …really looked like this? 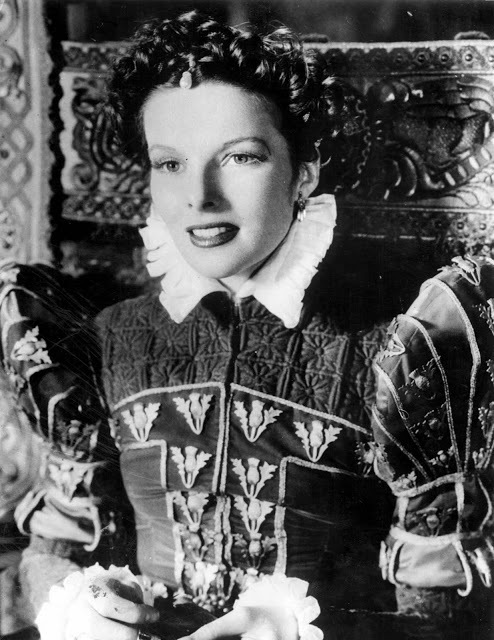 We enter so completely into the world of any black-and-white movie (and arguably, Mary of Scotland is not one of the best) that we tend to forget that anyone ever thought of them in terms of color. We think, perhaps, that the studios wouldn’t spend money on something the camera wouldn’t see. But think that one through: The actors would see it. 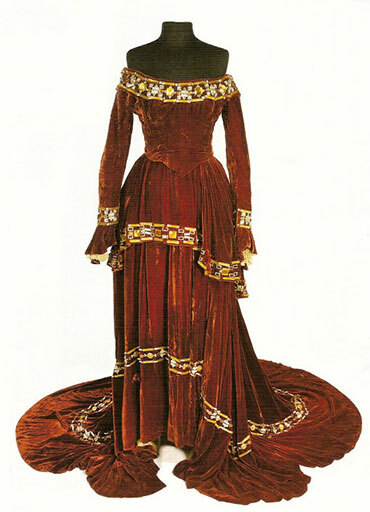 If Katharine Hepburn’s costume had really been composed of the shades of black and gray that we see on screen and in the picture above, she would surely have acted differently than she did in this sumptuous red and gold garment. And the camera would certainly have seen that. This is one of the things I most noticed in looking through the costumes in the catalogue, the striking variety of color in costumes and set pieces built for black-and-white movies. 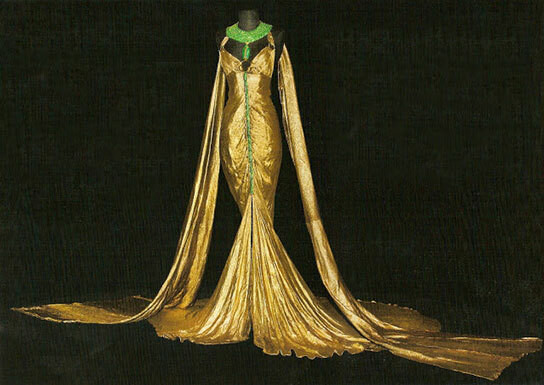 That gold gown from DeMille’s Cleopatra is another example; it may look silver on screen, but no, it was gold. 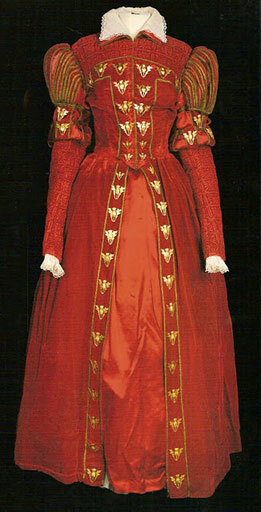 velvet two-piece period gown heavily jeweled with gold and white stones.” Talk about your Scarlet Empress! 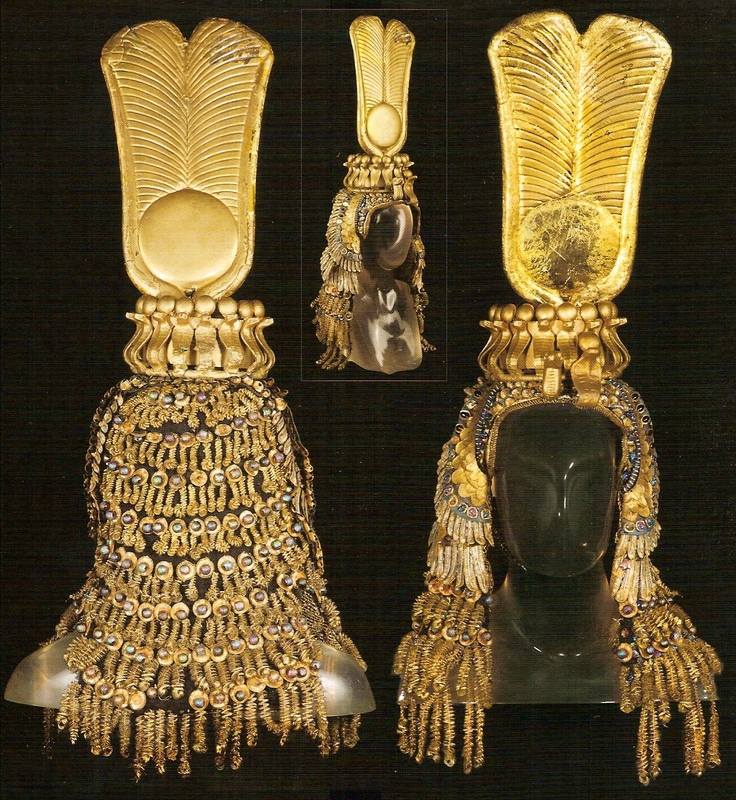 If you Ctrl-click on the picture to open it in a new tab, then “plus” it up to full size, you can see the exquisite detail in the jeweling, which probably went all but unnoticed by audiences at the time. (You can, alas, also see that time has visited its ravages on the gown — mostly, no doubt, between 1945 and ’71, when Debbie acquired it from 20th Century Fox.) Bidding on this one started at $3,000 and it sold for $7,000 plus another $1,610 for the house commission and sales taxes. 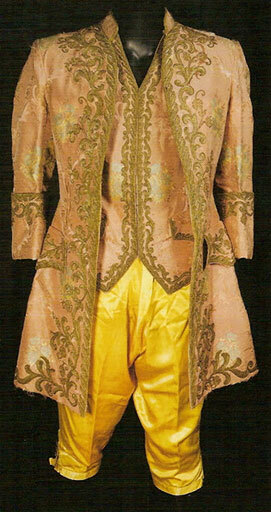 …while here’s a tunic worn by a servant attending the king at a royal ball. This costume, mind you, worn by a nameless extra whose own mother probably didn’t notice or recognize him. 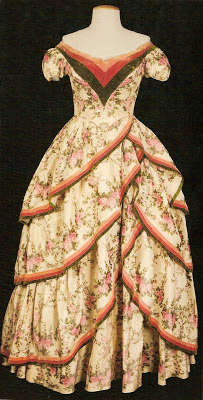 These three samples alone — and the catalogue has eight more from the same picture — bear witness to the fact that the set of Marie Antoinette must have been an absolutely intoxicating riot of color. It makes us wonder what the movie might have looked like if Technicolor had been available (well, technically it was, but MGM was still timid about using it). Even more than that, it makes me (at least) think what an absolute Wonderland the set of Marie Antoinette must have been. Can you imagine? Well, you’ll have to, because you’ll probably never see these costumes all together in the same place again. That, again, is the bad news of the Debbie Reynolds Auction: the opportunity to browse through these exhibits is in all likelihood slipping away from us forever. They’re all safe enough from outright destruction, no doubt, but they’ve been spirited away God knows where, to some private mansion or mountaintop retreat or private hall or atrium or display case, to be shared, if at all, with only a small circle of friends. That’s why I’m glad I ordered my own copy of Profiles in History’s catalogue, even though my vague ideas about going to the auction or putting in some bids never went anywhere. And it’s why I plan to get a copy of the next edition in December (who knows, by then I may even be able to bid on something). The catalogue is like a souvenir book from the gift shop of the Museum That Never Was, a memento of the last time these exhibits were all under one roof — something I can leaf through at my leisure and pretend that I actually spent a day or two in the Debbie Reynolds Hollywood Movie Museum and saw all this myself first-hand. If you’re interested in a catalogue of your own, you can (at least as of this date) order it here from Profiles in History. If you don’t want to pay the $39.95 — and don’t mind not getting the quality high-gloss paper it’s printed on — you can even download the catalogue for free on PDF. But be warned: It’s 312 pages and will probably take quite a while to download (and even longer to print), and it’ll probably take up quite a chunk of your hard drive when it gets there.